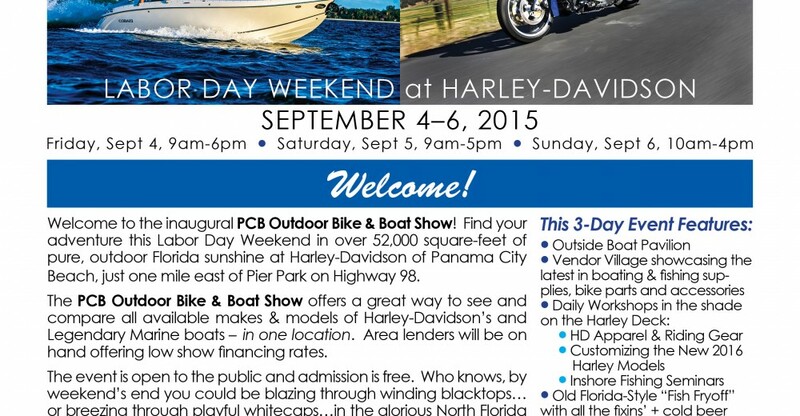 Harley-Davidson and Legendary Marine are teaming up for the area’s inaugural PCB Outdoor Bike & Boat Show, happening this Labor Day Weekend (September 4-6, 2015) at Harley-Davidson of Panama City Beach, located one mile east of Pier Park on PC Beach Parkway. The event is being presented by Salt Life Sport Optics and Innovations Federal Credit Union. The three-day PCB Outdoor Bike & Boat Show offers a great way to preview the brand new 2016 Harley-Davidson bikes and 2016 Legendary boat models, and compare all other available makes and models of bikes and boats – all in one location.